Hi, the other day we talked about what a great value Paper Pumpkin ® is, now today, I want to talk about the simplicity of Paper Pumpkin and the many other benefits of these great kits. Have you ever wanted to sit down and craft but felt you just didn’t have the time? Have you ever thought, “I would love to make a personal card for someone that I care for, but I just don’t want to make that investment into supplies”? Does any of this sound like you? What if I told you that Paper Pumpkin can remove those barriers for you? It’s true! Paper Pumpkin is fast and easy! 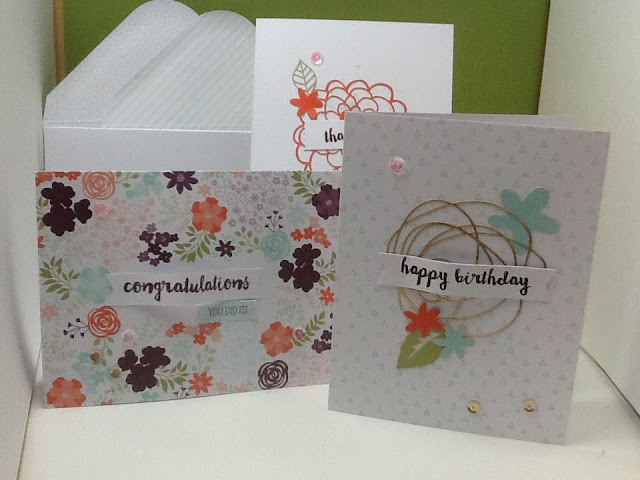 Using the February kit as an example, the 3 cards below, I put together in a matter of 20 minutes! That’s right! 20 minutes! Within 20 minutes I had followed the directions and completed 3 hand stamped cards that I can now give out to family and friends as needed. And the best part, I have the supplies for 6 more cards left over, so the next time I have a few minutes to spare, I can sit down and put the remainder of my kit together. So, yes, there is time to craft! In addition, adding to the value of these great kits, you now have a terrific, exclusive stamp set and at least one new ink spot to add to your collection and if you are doing the monthly subscription, your only investment is $19.95 + tax, so no big upfront investment for supplies and you don’t have to try to remember all of what you need while wandering around a craft store because all of the supplies necessary to complete your project get delivered to you in your little orange box. So, I urge you, if any of this remotely sounds like you, go ahead and sign up. Try a 3 month pre-paid subscription and just give it a test drive. I can promise, you will truly enjoy these kits as much as I do. The designs are always adorable and the simplicity is always there. And right now is the best time to try a 3 month pre-paid subscription as it is on sale for $55 and qualifies you for a free Sale-a-Bration™ item, just click here to Join Now! I hope you decide to join me with a Paper Pumpkin subscription. In the meantime, happy stamping!